Capturing the history of Willowbrook in the words of its ordinary residents brings the story of this community alive. 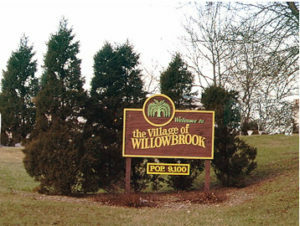 The following entries are several of these “reminiscences.” We hope you will contribute your stories to the collective memory of Willowbrook as it celebrates its anniversary. Feel free to add your recollections in the comment section. 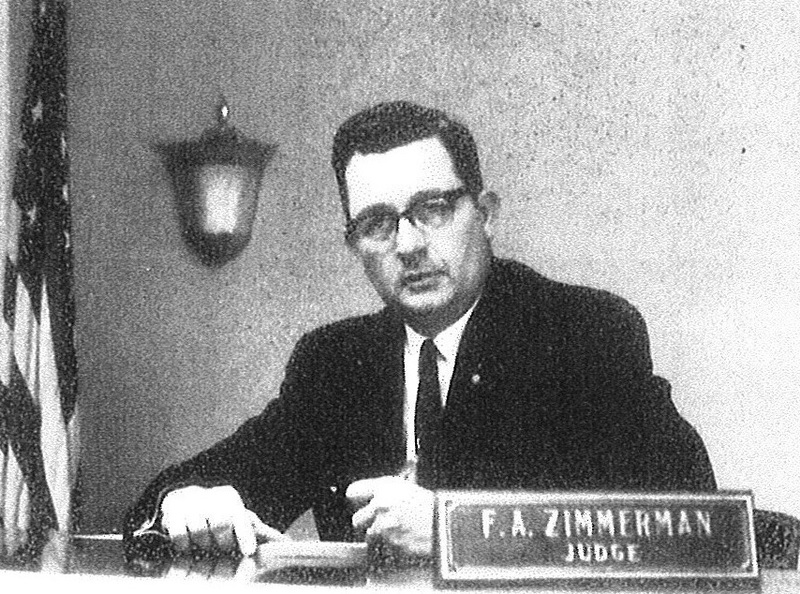 Frank and Marilyn Zimmerman moved to Ridgemoor West in 1959. They lived on Quincy Drive which was one of only 3 houses on a 40-acre unincorporated field. Route 83 was only a two- lane blacktop road. Marilyn remembers hearing cows mooing in the morning around what is now Lake Hinsdale Village. Frank recalls the fun his children (two boys and a girl) had fishing and ice skating on “their” hidden pond, which is now a lake bordering Stanhope Square and the Knolls. 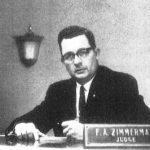 When Donald Schultz was Village President, Frank was elected Village Trustee on May 1, 1969 to April 30, 1973 and re-elected to the office from May 1, 1973 to April 30, 1977. 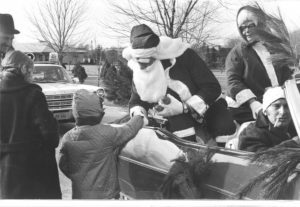 One of his favorite recollections was being able to play Santa Claus. Loretta Mourecek, assistant village secretary, would play Mrs. Claus. All decked out in their bright red outfits and sitting in an Oldsmobile convertible, donated by Tabor Olds with a police car and fire truck leading the parade, they would wind their way through the growing population of Ridgemoor, distributing plastic Santas and other toys made by Borse Plastics, to the children. Tony and Florence Borse donated the toys and other goodies. The Santa “couple” did this for seven or eight years and Frank said everyone had a wonderful time. Some of the Zimmermans’ other memories include popular spots to eat, like Dell Rhea’s Chicken Basket and Fredens. They remember Fredens being a house on Madison Street near Ruth Lake, where home cooking was served. The owners made a restaurant out of their living room and dining room and an area in back of the house. The wife was known for making great pies. Her husband managed the bar in the basement. “All tasty home cooking”. Another restaurant they recall is the Country Kitchen, which was on Frontage Road near Dell Rheas. They said the restaurant specialized in Bohemian cooking and people would come for roast duck, sauerkraut and dumplings. It was a small building that is no longer there. Going south on Madison, close to 90th, was Butch Sass’ Turkey Farm, a popular place especially around Thanksgiving, where you could go and buy a fresh turkey. Every year there would be a “Turkey Shoot” and a raffle would be held in the barn complete with a large spinning wheel to give out the prize–a free turkey. Frank said the fresh turkey sandwiches they served were delicious. Other recollections are of a poultry store on Route 83 near where Baker’s Square now stands, that only sold chickens and eggs. Then there was Kobel’s Tavern and grocery store before it became the Country House Restaurant. On 63rd Street near Clarendon Hills Road, stood Joe and Sophie’s greenhouse. Along with their daughter and twin sons, the couple sold flowers, tomato plants, peppers and other vegetables. Joe and Sophie knew every plant they sold and were always willing to offer suggestions regarding planting and potting. Sunrise Assisted Living of Willowbrook now occupies the property. Marilyn remembers Gower School on Frontage Road, east of Madison. She said it was the only grade school serving the community at that time. Part of the building is still there. Besides being a Willowbrook Trustee, Frank owned his own insurance agency in Western Springs and also served as a volunteer fireman and paramedic. He is proud of the plaque his received in 1988 from the Fire and Rescue Service acknowledging his years of distinguished service and loyalty to the Village of Western Springs where he was a volunteer for 30 years. Frank and Marilyn now make their home in Stanhope Square where Frank serves as Vice President on the condominium board. We moved into Golfview Hills in 1955. Willowbrook incorporated in 1960, but as I remember, Golfview and Ruth Lake decided to go it alone. We lived on 55th Place, and backed up to Ruth Lake Country Club. The buildings were white clapboard, trimmed with green; the initiation fee to join as a social member was reported to be $400. A story was told that one year there was a terrible drought and Ruth Lake dried up leaving only 50 square feet of water. Hundreds of fish were trapped in the cracks and natives shoveled them into gunny sacks. Salt Creek dried up that same year and fish were hauled away by the truckload (from History of Golfview Hills by Eleanor Erlenborn). Freden’s Restaurant was one of the few local restaurants in the area. The restaurant was in a 2 story Tudor-style house, and served food on two or three levels, the bar was in the basement. The house was about 20 feet from Madison and the parking lot began there. Kermit Coddington was the owner and manager. Sundays the gravel parking lot would be crowded with cars parked willy-nilly. It was very popular and its reputation went as far as Park Ridge. The cook was famous for her pies and her chicken pot pie. The Coddington’s lived in a house (with a barn) far back from the parking lot that filled up every Sunday. Sometimes Kermie’s kids would ride their horses down Madison St. Some hot summer days the horses would get loose and head for Ruth Lake and take a swim. The Red Lantern was where Balducci’s is today. There was a shooting there in the late ‘50’’s or early ‘60’s. I don’t remember if any one was killed. Two parking lots away was Patrick’s at the corner of Madison Street and Route 66 across from the air field. Eventually much of its runway was torn up and it became the helicopter pad we have today. Dell Rhea’s Chicken Basket and Country Kitchen were near each other on old Rt. 66. Route 83 was a two lane highway until 1967 when it was widened and the 55th Street interchange was begun. When we first moved to the area there was very little traffic and no stop lights. So much of the area south of 55th Street and west of Rt. 83 was prairie (and hay fever haven) in the fall you could hear hunters shooting pheasants and mallards. There were a couple of lovely farms east of Rt. 83 on Plainfield Road. International Harvester had a huge testing lab that reached from County Line Road along Plainfield Road to Madison Street and on south a couple miles. One year (1965 or thereabouts) my son and a friend started pulling bones out of Ruth Lake. We made arrangements to take the bones to the Field Museum to be analyzed. They were disappointed to find they had only horse bones, no Tyrannosaurus Rex’s. We soon learned about a story from an old timer that a horse drawn trolly line ended at 55th Street and Rt. 83 and when the horses got too old, they were driven into Johnson’s Slough or Ruth Lake. Another story has the bones as a result of people mistaking the slough for prairie and losing their horse and wagons in the peat bog. Whatever the story was, we had a lot of bones in our garage!! Special thanks to the Golfview Hills Woman’s Club and especially to Jan Kaminski and Ann Diedrich for sharing some of their memories of Golfview Hills and the surrounding area which includes Willowbrook. They recall back in the olden days (mid 50’s) when you could almost forget your alarm clock. The roosters living across Route 83 regularly gave them a wake-up call. Hinsdale Airport was located at 75th Street between Madison and Route 83. Small planes could be seen coming in for a landing or taking off over Route 83. The area later became a heliport and an industrial park. Over the years there have been many sightings around the streets of Golfview Hills. Astronaut John Glenn, the first American to orbit the earth was seen jogging while a guest of one of the residents. Among the others who have graced their shores was Rich King, sports announcer for Channel 9, and Paul Malloy Sr., Sun Times reporter and author of “Eight Is Enough”, which was based on his family. They remember the landmark Fredens Restaurant, site of several of their chili suppers, which was sold and razed to make way for the Ashbury Woods condominiums at Madison and 58th Streets. Godair Retirement Home at 63rd and Madison was torn down and those residents moved to King Bruwaert Retirement Home. Those who owned individual homes in Godair Park remained. The rest of the area is now Ruth Lake Woods condominiums. A tragic event was the crash of a Trans World Airlines plane into a cornfield across Route 83 near 59th Street and Clarendon Hills Road. The Lockheed L-049 Constellation, named “Star of Dublin” was about nine miles west of Midway Airport when it went down at 2:07 a.m. on September 1, 1961 killing all seventy-three passengers and the crew of five. According to the New York Times of September 2, 1961, the crash was the fourth worst in United States air history and the worst single-plane disaster in United States commercial aviation. The plane (a four-engine piston plane) had taken off from Midway Airport and was headed for Las Vegas, Los Angeles and San Francisco. It crashed only four minutes after takeoff. According to reports, the plane swooped to earth fast at a steep angle. No houses were hit. The New York Times’ article of September 28, 1961 reported that the Civil Aeronautics Board believed the cause of the accident to be a missing bolt vital to the operation of the hydraulic control system. TWA officials reported that the bolt had been lost on impact when the plane hit the ground. Most early settlers in Golfview Hills remember that rainy night. Many were awakened when their bedrooms lit up as though it were daylight; and as the light faded to darkness, the sirens began and continued for a long, long time. For days after the crash traffic was congested with cars parking along Route 83 and people walking across the field to view the disaster.